Even in a branch of the military like the Marines, which prides itself on brawn and toughness, intelligence is a critical part of any operation. Knowing the whereabouts of an enemy force and its capabilities inform the decisions of Marine commanders as they plan strategy. Intelligence Specialists in the Marines are familiar with all phases and facets of intelligence operations. The military occupational specialty code (MOS) for this entry-level job is MOS 0231. As the name suggests, the typical duties of this job include the collection, recording, analysis, processing, and dissemination of information. The intelligence specialist, depending on their rank, may supervise intelligence sections of commands up to and including the Marine Expeditionary Force (MEF). 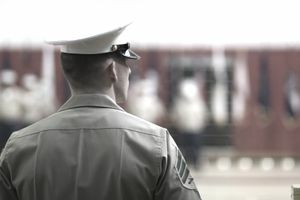 As with all Marines, intelligence specialists must complete boot camp at one of the Recruit Training Depot locations (either at Parris Island, South Carolina or San Diego, California). In order to qualify as an Intelligence Specialist, recruits need a score of 100 or higher on the General Technical section of the Armed Services Vocational Aptitude Battery (ASVAB) test. They'll need to complete the Marine Air-Ground Task Force (MAGTF) intelligence specialist entry course at the Navy-Marine Corps Intelligence Training Center (NMITC), in Dam Neck, Virginia. Intelligence specialists who have a Defense Language Aptitude Battery score of 100 may be eligible to attend language training at the Defense Language Institute at Monterey, California. Candidates for this MOS have to be eligible for a top-secret security clearance and access to Sensitive Compartmented Information based on a completed Single Scope Background Investigation (SSBI). This means that candidates interested in this position should have a clean criminal record and be able to pass a background check that may include a credit check and interviews of friends and family. These checks may go back as far as 10 years, so if there are unresolved issues, try to handle them before enlisting. They also must have 24 months obligated service remaining upon graduation and have to be U.S. citizens. This job is the first specialized segment of training for a Marine seeking a career in military intelligence. Through managed on-the-job training, Marines in MOS 0231 eventually have the training to become intelligence section chief at the 0300 level, and eventually, have the skills and training to serve as mission-critical intelligence officers at the 0400 level. If you have an interest in a career in military intelligence, any one of the branches of the U.S. military will provide options, but if you're determined to be a Marine, then MOS 0231 is where you'll start your intelligence training. Duties: For a complete listing of duties and tasks, refer to MCO 3500.32, Intelligence Training and Readiness Manual.